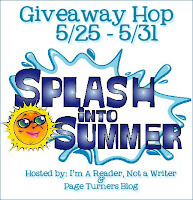 I have been extremely remiss in announcing my Splash Into Books blog hop winner. The school year ends in one week so I have been scrambling to get stuff done in my classroom and so I've neglected my blog a bit. Congrats to Alice and thanks to everyone who entered. Check out my other giveaway going now until June 7th. It is open internationally and it's for A Pug's Tale by Alison Pace. Anyone who loves dogs, art, and/or mysteries will be delighted with this adorable book.